Box Text: The ultimate game for Game Boy returns! Following the success of the original Runes of Virtue comes this exciting new game. Britannia needs your help again! Lord British has summoned you back to Britannia, where the Black Knight has abducted Britain’s mayor, Lord Tholden. This time you have an enchanted Ankh to aid you in your heroic quest. Choose a familiar character from the Ultima storyline. Shamino wields his axe, Iolo the bard fires his longbow, Mariah the mage employs her magical Wand of Fireballs, and the armored knight Dupre carries a sword. Search out magical weapons, talk to the townspeople for clues, but watch your back! You’ll need every advantage you can get in this titanic struggle! Fight bats, rats, trolls, goblins and powerful Wizards in your efforts to foil the Black Knight’s sinister plans. Britannia needs you now more than ever. Don’t fail Lord British and his people! 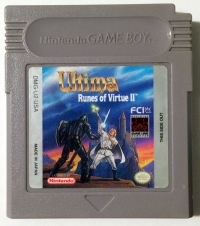 This is a list of VGCollect users who have Ultima: Runes of Virtue II in their Collection. 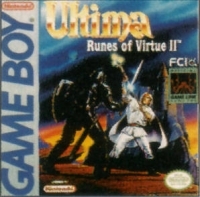 This is a list of VGCollect users who have Ultima: Runes of Virtue II in their Sell List. 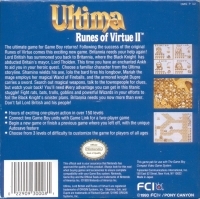 This is a list of VGCollect users who have Ultima: Runes of Virtue II in their Wish List.